Flu Vs. Cold Symptoms – What’s the Difference? Learn to tell the difference, and start feeling better fast! We’re in the heart of the winter season – full of fresh snow, hot chocolate and cozy fireplaces – oh, and cold and flu germs. Yup, nothing takes the magic out of a beautiful winter day quite like a little fever and congestion. Millions of people suffer through colds and the flu each year – and hundreds of thousands are hospitalized for flu symptoms throughout the season. However, the similarities of flu vs cold symptoms can leave us wondering what exactly is wrong with us, and how we can treat it. While the these two illnesses do have some symptoms in common, there are ways to tell the difference. – It hits you like a ton of bricks. The flu tends to come on pretty hard and fast, and is much more aggressive than the cold. The flu will wipe you out! – You’re experiencing chills, fatigue, muscle aches, and tightness of the chest. Some people may also run a fever. – Vomiting and diarrhea are symptoms of the flu that are not present in the common cold, though they are more common in children than adults. – You feel the symptoms gradually building up for a day or two. – Most of your symptoms are above the neck – runny nose, coughing, sneezing, watery eyes, sore throat. – You may experience a fever and body aches, but not nearly as severe as those that come with a flu. 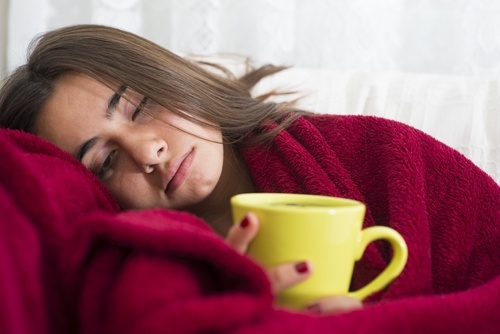 Although the symptoms may differ, cold and flu prevention tips look much the same. Living a healthy lifestyle – exercising regularly and eating a diet rich in fruits and vegetables – goes a long way in boosting your immunity, but there are a few other steps you can take. “Wash your hands” is probably the most common cold prevention tip, and it’s a good one. But how often do you “wash” your phone? Make it a point to regularly wipe your phone down with a disinfecting wipe. Make sure you are getting a good night’s sleep. Your body uses sleep to rejuvenate and fight germs. Chronic stress also suppresses immune function and greatly increases your chances of falling sick. Fill up on antioxidant rich foods, which boost immune function. Also load up on foods rich in omega-3 fatty acids and Vitamin C.
Even though it’s cold out, getting outside for a brisk walk or jog can do wonders to prevent the cold and flu. Any sort of moderate physical activity boosts immune function. No matter how healthy a lifestyle we lead, we can’t always avoid falling victim to a seasonal cold or flu. But we can start feeling better faster. Antibiotics won’t help you here. These powerful drugs are designed to fight bacteria, and cold and flu symptoms are caused by viral infections. There are prescription medications available that may shorten the flu by a day or two, but there is no “cure” for the common cold. Treatment for both a cold and the flu usually focus on individual symptoms. Do the “neck check.” If your symptoms are “above the neck,” like a stuffy nose and sneezing, working out can help with congestion and fatigue. However, if your symptoms are “below the neck,” like coughing or nausea, take it easy. Grandma was right – chicken soup (and other clear broth-based soups) really can help you feel better. The hot liquid helps increase blood flow and reduce congestion. Soups and hot teas also help you stay hydrated, which is key to recovery. Stay home. Taking a sick day or two will not only help you recover faster, but you will also be protecting the rest of your workplace from falling ill. Looking for more cold and flu prevention tips? Give us a call, and for more information on living a healthy lifestyle, stay up to date on our Health and Wellness Blog.